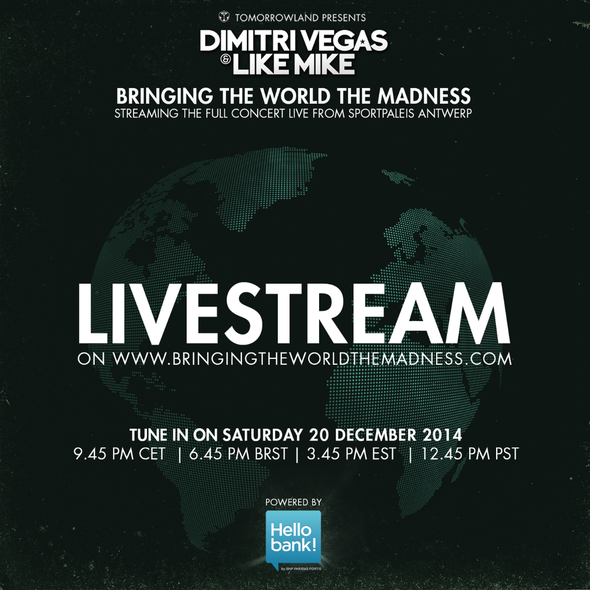 On 19 and 20 December Dimitri Vegas & Like Mike will take over Antwerp’s Sportpaleis Antwerpen, as the #2 DJs in the world launch the first step in their first official world tour - ‘Bringing The World The Madness’. As part of the occasion Dimitri and Mike have teamed up with Hello Bank to bring the show directly to those clubbers that weren’t able to get tickets for this double run of opening events. After selling 33,000 tickets in less than 24 hours for their ‘Bringing The World The Madness’ kick off shows, the duo are now only days away from delivering two performances to a packed house of 40,000 people. Curated and powered by Tomorrowland festival, fans will have their senses treated to big stage production, all wrapped in the trademark Dimitri & Mike DJ show. After a score of releases in ‘Mammoth’, ‘Wakanda’, ‘Chattahoochee’, ‘Find Tomorrow (Ocarina)’ and ‘Tremor’, alongside gigs at festivals such as Electric Zoo NYC, Dream Valley, Creamfields and their Belgian and US resident home festivals Tomorrowland and TomorrowWorld, it’s safe to say that 2014 has been a big year for the duo.